Dallas, TX, July 1st, 2014 – Leisure & Allied Industries today announces a major reorganization that will see Embed, LAI Games, and The Locker Network combined under a new umbrella company, the Helix Leisure group. This combination, which becomes official on July 1st, 2014, will allow the Helix Leisure companies to leverage their combined strengths and global reach, and a seamlessly integrated product offering, while preserving each of the individual brands. As out-of-home entertainment venues evolve towards delivering more sophisticated and spectacular experiences, Helix Leisure is uniquely positioned to fulfill the needs of operators in matching the high expectations of today’s consumers. The company has a network of six full offices worldwide to provide in-region support and a comprehensive offering of cashless debit card systems, POS and redemption solutions, customer loyalty, booking and ticketing, electronic locker operations, and a full range of amusement and prize-vending machines. Each of the individual companies will continue trading under their current brand names and retain dedicated and focused R&D teams. Following the reorganization, Leisure & Allied Industries will operate two fully-independent divisions: its leading FEC chain, Timezone, and the Helix Leisure group. Current CEO of LAI Games and The Locker Network, Theo Sanders, will assume the role of CEO of Helix Leisure. For more information, visit the group website at HelixLeisure.com. Helix Leisure, a division of the LAI Group, provides the out-of-home entertainment industry with an integrated offering of cashless debit card systems, POS solutions, customer loyalty, redemption management, entrance control, booking & ticketing, electronic locker operations, and a full range of amusement machines. The company is comprised of industry leaders Embed, LAI Games, and The Locker Network. With offices in the USA, UAE, UK, and Australia, Embed provides systems that are a total operating solution for any entertainment facility. Embed Systems allow for admissions control, machine monitoring, cashless operation of games and attractions, retail, food and beverage sales, loyalty systems, full prize redemption management, and integrated event scheduling. Transform your business and find out more at www.embedcard.com. 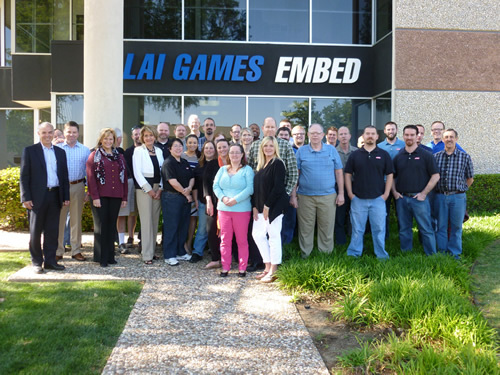 LAI Games USA, a subsidiary of Helix Leisure, has been a leader in the interactive entertainment and game industry for over 50 years. The company develops, manufactures, and sells coin and card operated prize merchandising games, ticket redemption games, photo booths, and kiddie rides to distributors, operators, and entertainment centers around the world. For more information, please visit www.LAIGames.com.